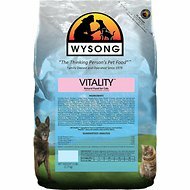 Wysong Optimal represents new advanced technology that moves companion animal nutrition closer than ever to archetypal genetic expectation. Wysong Optimal Vitality is a top of the line, no compromise dry diet for adult cats. It contains an an unrivaled spectrum of nutraceuticals and micronutrients, and has unsurpassed levels of enzymes and probiotics. Old Formulation: Chicken Meal, Organic Chicken, Turkey Meal, Pea Protein, Potato Protein, Peas, Chicken Fat, Flaxseeds, Beet Fiber, Natural Flavor, Sesame Seeds, Montmorillonite Clay, Crab Meal, Whey, Coconut Oil, Chia Seeds, Salt, Taurine, Calcium Carbonate, Calcium Propionate (a preservative), Tomato Pomace, Choline Chloride, Yeast Extract, Organic Barley Grass, Blueberry, Yogurt (Whey, Milk Solids, Yogurt Cultures), Dried Kelp, Apple Pectin, Dried Kale, Dried Spinach, Dried Carrots, Fish Oil, Citric Acid, Chicory Root, Mixed Tocopherols, Rosemary Extract, Yeast Culture, Minerals (Potassium Chloride, Zinc Proteinate, Zinc Sulfate, Ferrous Sulfate, Iron Proteinate, Copper Sulfate, Copper Proteinate, Manganese Sulfate, Manganese Proteinate, Sodium Selenite, Calcium Iodate), Vitamins (Ascorbic Acid [source of Vitamin C], Vitamin E Supplement, Niacin Supplement, Calcium Pantothenate, Vitamin A Supplement, Thiamine Mononitrate, Pyridoxine Hydrochloride, Riboflavin Supplement, Vitamin D3 Supplement, Biotin, Vitamin B12 Supplement, Folic Acid), Dried Bacillus licheniformis Fermentation Product, Dried Aspergillus oryzae Fermentation Product, Dried Aspergillus niger Fermentation Product, Dried Enterococcus faecium Fermentation Product, Dried Lactobacillus casei Fermentation Product, Dried Lactobacillus acidophilus Fermentation Product, Dried Bacillus subtilis Fermentation Product, Dried Lactobacillus plantarum Fermentation Product, Dried Lactobacillus lactis Fermentation Product, Pepper. 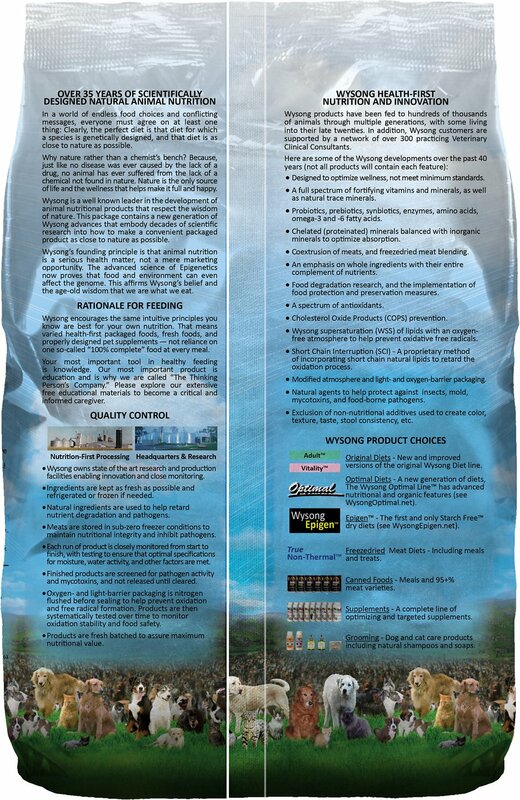 New Formulation: Chicken Meal, Organic Chicken, Turkey Meal, Pea Protein, Potato Protein, Peas, Chicken Fat (preserved with Mixed Tocopherols), Flaxseeds, Dried Plain Beet Pulp, Natural Flavor, Sesame Seeds, Montmorillonite Clay, Crab Meal, Dried Whey, Coconut Oil, Chia Seeds, Salt, Taurine, Calcium Carbonate, Calcium Propionate (a preservative), Dried Tomato Pomace, Choline Chloride, Yeast Extract, Organic Barley Grass Powder, Dried Blueberry Powder, Dried Yogurt, Dried Kelp, Apple Pectin, Dried Kale, Dried Spinach, Dried Carrots, Fish Oil, Citric Acid (a preservative), Inulin, Mixed Tocopherols (a preservative), Rosemary Extract, Yeast Culture, Minerals (Potassium Chloride, Zinc Proteinate, Zinc Sulfate, Ferrous Sulfate, Iron Proteinate, Copper Sulfate, Copper Proteinate, Manganese Sulfate, Manganese Proteinate, Sodium Selenite, Calcium Iodate), Vitamins (Ascorbic Acid [source of Vitamin C], Vitamin E Supplement, Niacin Supplement, Calcium Pantothenate, Vitamin A Supplement, Thiamine Mononitrate, Pyridoxine Hydrochloride, Riboflavin Supplement, Vitamin D3 Supplement, Biotin, Vitamin B12 Supplement, Folic Acid), Dried Aspergillus Oryzae Fermentation Product, Dried Enterococcus Faecium Fermentation Product, Dried Lactobacillus Casei Fermentation Product, Dried Lactobacillus acidophilus Fermentation Product, Dried Bacillus Subtilis Fermentation Product, Dried Lactobacillus Plantarum Fermentation Product, Dried Lactobacillus Lactis Fermentation Product, Pepper. I hate to do the one star, but when you spend good money on healthy food, and they try to bury it, whats a cat mother to do? Geesh if only they could talk. I have bought so many different expensive brands to try to get them to eat healthy. They just want their Fancy Feast filet & salmon. Sorry Wysong its not your fault. The shelter cats love to see me coming with box loads of rejects from my cats. This food is worth every penny. We mix this half & half with the vitality formula. Our cat is 6.5 years old and has never had a hair ball (she's a long-haired Siberian), been sick, had dry skin or allergies and she has a ton of energy! The only downside is stinky poop. Each 5 lb bag lasts us about 7 weeks free-feeding. 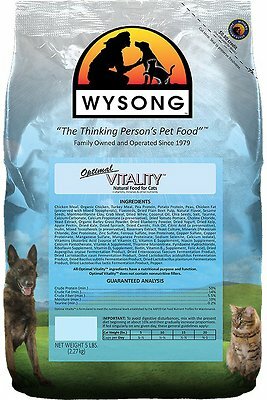 Cats really like it and I like the good ingredients in Wysong products. Love dealing with Chewy! Great prices and quick to ship. Always a pleasure. Excellent quality food, that's relatively low in carbs/starch. My cat loves it and he's used to getting the best including a lot of raw meats. So many companies fill their kibble with a loads of cheap starch that is terrible for cats health. Wysong makes some quality foods and this is one of their best, and still relatively affordable. I tried the starch free Epigen, and even though my cat ate the sample I tried, when I bought the bag he wouldn't eat it, so I'm happy to stick with the OV. I'm trying this food for a couple of overweight cats. They really like it and it's the lowest in carbs of any dry food I can find. I'm hoping it helps them with weight loss! my fussy kitty loved it instantly and won't go back to her usual dry kibble. I am so pleased to feed her a really clean, quality, nourishing food. My picky cat loves this food. He snubbed his nose at brands of food that we're not as high quality, but he love this.